It is their first year in the Programa Auxiliars de Conversa, but in Col·legi Santa Anna they sure know how to make the most of this program! Their conversation assistant, Sean, takes small groups of Primary and ESO students to help them improve their English and encourage them to speak. Here are his thoughts on the Program: thanks for writing, Sean! Since my first day at Santa Anna, I have had an amazing time with both the students and the teachers in and outside of my classes. I have no doubt that this will continue until the end of the course in June, because everyone is so easy to get along with and most of the students are lots of fun to work with. My lessons consist of taking small groups of students out of classes from both primaria and ESO and improving their spoken English level, through exam practices, role plays and themed conversations, alongside other fun activities. I was so surprised by the level of English in the school, it is significantly better than I had originally presumed. I found that no matter what the student’s level of oral English, they will always try and have a conversation with me or ask questions, it is incredible to see such a large interest in a language. As well as taking the students for oral practice in my lessons, I have also been included in other activities. 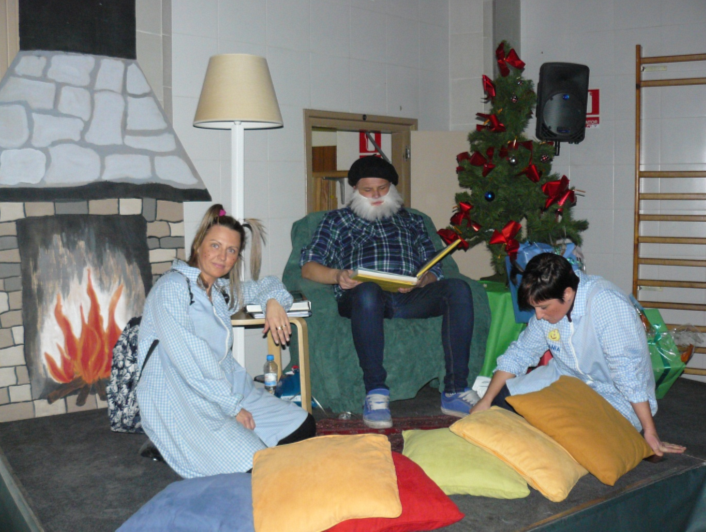 These include the school play, where I played a grandfather who tells the story of ‘Els Pastorets’, a traditional Catalan Christmas story, and most recently, playing the bass with some students in a music group for Peace Day (El Dia de Paz) and Open Doors Day (Puertas Abiertas). Being included in these events with the students has let me get to know the students better and helped to create a strong bond between us, which in turn encouraged them to participate more in class. Sean took part in ‘Els Pastorets’! I strongly recommend for any CAPS, new or current, to include themselves with as many activities with the students as possible as it is a very enjoyable and entertaining experience! While I will be staying in Catalunya I will be staying with a total of 3 families. The families I have already lived with have already been extremely welcoming and have treated me like another child in their home, and most weekends have been filled with enjoyable activities. Such activities include visiting Barcelona or going climbing in the mountains, and if we haven’t got any plans for the weekend I am never bored because the families always try and include me in their plans, or I go out and visit my friends I made from the CAPS program, who live in the same city as me. There’s never a dull moment in Catalunya! In conclusion, if you haven’t applied for this course already, then you should straight away because it is an incredible experience and one not to be missed!